Homeownership rates mostly increased across the state in 2018. Sacramento beat out Riverside for the highest rate of homeownership, at over 64%. Los Angeles County remains the lowest at just below 50%. Statewide, the average homeownership rate rose slightly to 55.2%. California’s homeownership rate will likely remain roughly level in 2019, having reached a peak for this housing cycle. Now, as home sales volume slows and prices decline going into the next recession, Californians will be more cautious to enter homeownership. The average rental vacancy rate rose slightly to 4.4% in 2018, up from the previous year but still below historic norms, indicating demand continues to outstrip available rentals. The highest rental vacancy rate in 2018 was 5.6% in Riverside. The lowest was 4.0% in Los Angeles. Rental vacancies will continue to linger below historic norms until homeownership rates stabilize and builders begin to adjust, expected to continue statewide during 2019 and 2020. Meanwhile, rents will rise beyond the rate of inflation until multi-family construction rises, as it did in the 1980s, exerting downward pressure on rents. Post updated March 1, 2019. Original copy posted January 2013. 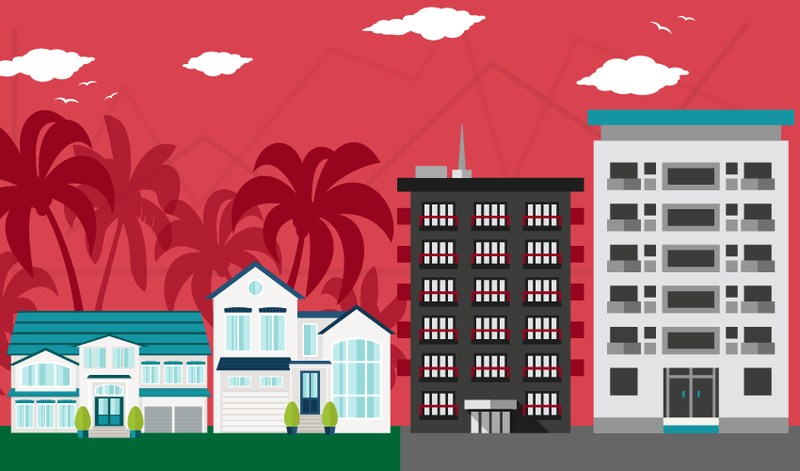 Are rentals the future of California real estate? As homeownership and rental vacancy rates decline in counties across the state, a change in the housing market is on the horizon. The future will be determined by jobs, construction and foreclosure rates. 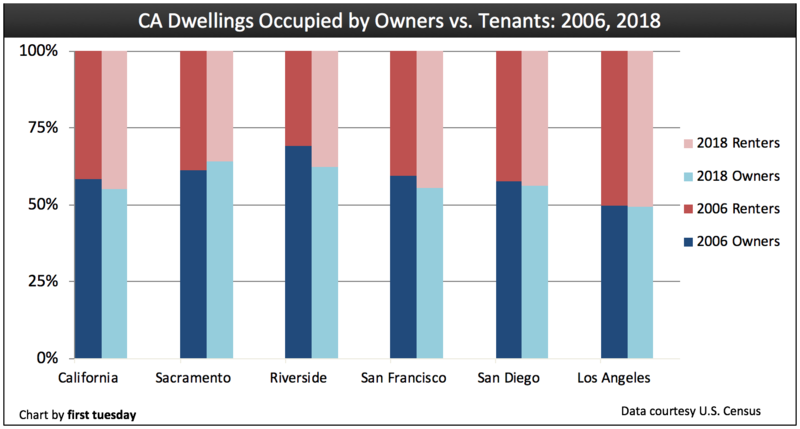 Chart 1 tracks the changing percentage of dwellings occupied by owners versus tenants in California. The sampling is indicative of our more populous counties. Chart 2 tracks the homeownership rate in California and a sampling of its more populous counties. Chart 3 tracks the rate of rental vacancies in California and a sampling of its more populous counties since 1993. Rental vacancies tend to rise in times of increased homeownership and excessive residential construction. Dark bars indicate periods of recession. Increasingly, Californians are turning to rental property for their shelter. This heavy reliance on rentals comes after the historic spike in homeownership during the Millennium Boom. In the past, the thought of owning a home was driven by the noise of warped public policies and the distraction of ever more subsidies. The government intended to get tenants out of rentals and into homeownership. Favorable personal attitudes about homeownership climbed for about 60 years. Then, in quick succession, we experienced a pricing bubble, a recession and a once-in-a-lifetime financial crisis. Today, many households are still recovering from the financial chaos of the 2008 recession and lengthy recovery. The renter population has swelled, as fewer are able to buy after dealing with years of underemployment or unemployment. This has led to a supply issue, as more renters compete for multi-family units in desirable areas where zoning restricts builders from meeting demand. This has caused rents to rise much more quickly than income. Many former California homeowners lost their property to foreclosure in the days following the 2008 recession. These owners suffered income loss due to unemployment. Some were simply unable to make payments when the time came to fully amortize a complex adjustable rate mortgage (ARM). Financially unable to buy a replacement home to house their family, many homeowners moved into comparably-sized SFR rental property in the same school district. At first, the monthly rent was less than their previous mortgage payment. However, as rents have risen quickly in the past couple years, many renters are now looking to homeownership once again. But — their credit scores are often too damaged by the foreclosure (or short sale) to qualify for purchase-assist financing to buy a replacement home. Further, pouring high amounts of their income into rent disallows them from saving up for a down payment on a new home. These renters-by-necessity are foreclosed-out homeowners and forced-out short sellers. They have no savings, damaged credit scores and an enduring emotional aversion to homeownership — at least in the foreseeable future. So, for the next few years these families will live in rented homes. These and others have forfeited the tattered American Dream of homeownership for renting. This situation is now a full blown reality for homeowners across California. At the end of 2018, California has one of the lowest homeownership rates in the nation at 55.2%. Rentals as a percentage of all housing are highest within high-density metropolitan areas, especially in cities like San Francisco and Los Angeles. On the other hand, there are areas of traditionally high homeownership, like Riverside/San Bernardino and Sacramento. These regions have maintained a lifestyle focused on suburban housing, even through the difficult years of recession and today’s ongoing recovery. However, signs indicate that housing habits are changing even in these homeownership outposts. Future homeownership rates depend upon the coming wave of first-time homebuyers. These homebuyers are typically aged 25-35. Often, they will purchase a low-tier or mid-tier SFR for their first homes. 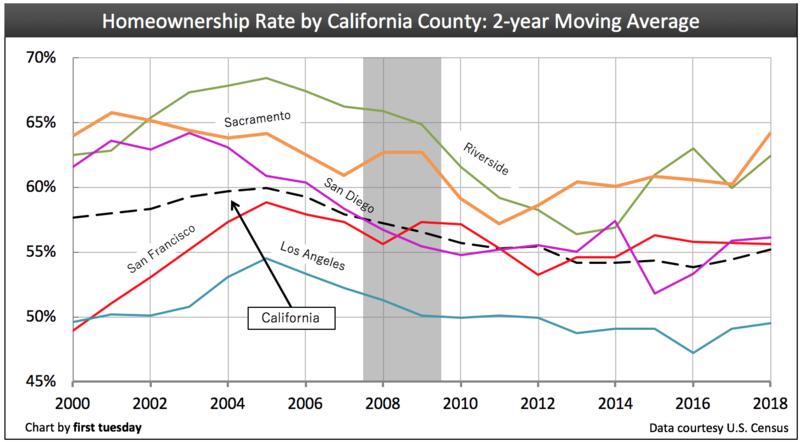 Job loss, however, has changed the timing of homeownership in almost every region of California. First-time homebuyers are declaring themselves financially unable, or just plain unwilling, to purchase a home in spite of cyclically low prices and mortgage rates. The more realistic age of today’s typical first-time homebuyer is 30-40 years. As jobs continue to return, they arrive first and fastest in city centers. After the distressing behavior of the housing market in the recent recession, more of the newly employed will be renting than owning while they amass down payments. An increase in rental activity will naturally be followed by an increase in rental construction. As vacancy rates linger below historic norms (generally near 5% averaging 4.1% in 2015) and rents rise beyond the rate of inflation, multi-family construction will return to keep rents and prices down. Apartment and condo construction was at its lowest in 2009, and has increased very slightly most years since then. Multi-family construction fell back in 2016 but recovered somewhat in 2017 and 2018. Going forward, multi-family construction will be influenced positively by legislative changes favoring low- and moderate-income, dense housing. Counties like Riverside were at the center of California’s housing boom in the early 2000s. During the Millennium Boom, homes were built and sold faster than was sustainable in the long term. Riverside’s homeownership rate jumped almost 6% in 2000-2005, pulling the state’s rate of homeownership up with it. Those homeownership gains were illusory. Since 2005, Riverside’s rate of homeownership has dropped to below 60%, seven percentage points below its level at the peak of the boom. The gains made in the last decade have been entirely erased and the decline continues. San Francisco’s consistent homeownership rate is due to the general lack of SFR construction and prevalence of high-tier properties in much of the Bay Area. Further, their population has been less susceptible to foreclosure due to strong local employment in the information technology industry. Many large southern coastal cities remain examples of past suburban sprawl and inefficient zoning. They have, however, begun to reorganize to a more sustainable, centralized model of higher density urban living. Some who were burned by short sale or foreclosure will eventually return to the homeownership. 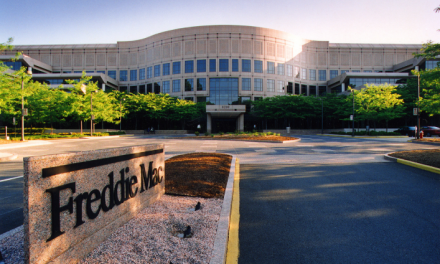 They will be joined by first-time homebuyers who have put off homeownership. This return will occur when their jobs, savings, deleveraging, credit scores and confidence in the economy permits them to do so. Meanwhile, bedroom cities in the suburbs are replete with vacant SFRs and apartments, as those who lost their home are most likely to end up renting in urban centers. Homes in all price tiers are being purchased by buy-to-let investors who are intent on collecting them solely for the value they present in monthly rental income. On the other hand, speculators acquiring real estate generally do so for growth only. They prefer to sell, as a day trader would, for a quick profit and without the inconvenience of a tenant. In the absence of willing homebuyers, many syndicators and speculators have altered their resale expectations, hybridizing their holding plans to include renting the properties to cut their carrying costs and wait longer to sell. Rental vacancies are driven by varying local demand. The key factors influencing vacancies are the local jobs situation and the local attitude toward SFR homeownership and renting, which change over time. 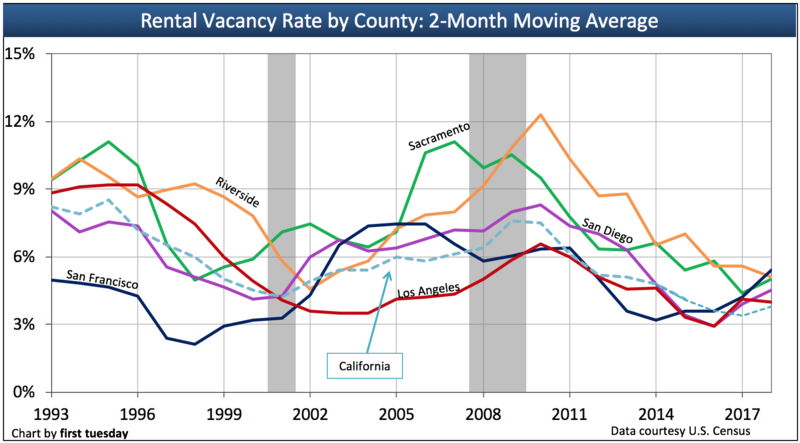 For instance, Sacramento and Riverside both experienced massive vacancies during 2006 into the early days of the 2008 Great Recession. Since then, these areas have seen rental vacancies drop dramatically. The many foreclosed homeowners in that region have taken up available rental inventory. Trends point to a continued increase in rental demand in upcoming years. While some regions, especially Riverside, will take a longer time to shift from the 1950’s standard of suburban SFR homeownership, rental property is poised to lead the real estate recovery. Even in counties with higher than average homeownership rates, rentals will emerge as significant profit centers for landlords and property managers. Agents in urban areas may consider adding property manager to their title, as demand for this skill will undoubtedly rise throughout this decade. Also, following the local construction and job trends will help agents prepare for future demand in their communities. SFR homeownership is nowhere near becoming obsolete. But its 30-year dominance is definitely a relic of the past. PreviousRentals: the future of California real estate? 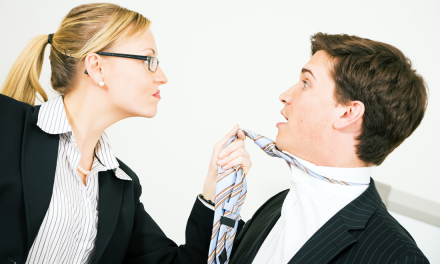 Is a trustee for a mortgage-in-default considered a debt collector? When renters are at their “minimum” sell!!!! 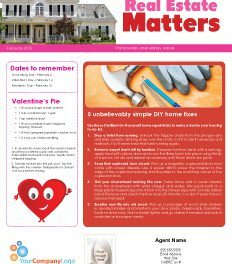 Renters are the “left overs” or the “EXTREME FRUGAL”…. Decent article; just seems about 2 years out of date. These “forecasts” are and have been already happening for some time. And as far as an “absence of willing homebuyers”, not in the Bay Area. I wish it were so… and my buyer clients were NOT continually being frustrated by multiple, over asking, and cash offers at these crazy levels. Folks are bidding up beyond current, intrinsic value in my opinion, but it is reality for now. Even the trustee sales to investors are going on at near retail; quite a few times over current retail price! Flippers have been making bank & quick; contrary to the assertion in this article on that point. short sale position” We are definitely not out of the woods yet!